How do I get to the Sames Auto Arena? 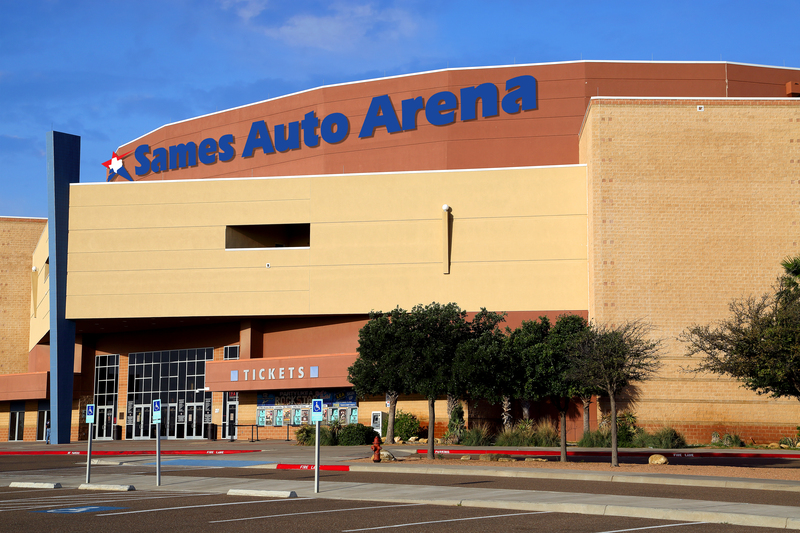 What are some interesting facts about the Sames Auto Arena? What are the general policies of the Sames Auto Arena? What is the history of the Sames Auto Arena? What can you tell me about Laredo? The Sames Auto Arena is on Texas State Highway Loop 20, also known as Bob Bullock Loop 20 and Jacaman Road. The Laredo International Airport and Texas A&M International University are less a mile from the site. From IH-35 North (Northbound from Mexico) Exit 4 (Del Mar Blvd) drive to traffic light, turn right, drive 5 miles east to Bob Bullock Loop, turn right and drive 3 miles to Jacaman Rd., turn right on traffic light and enter the Sames Auto Arena through Sinatra Parkway to access parking lots A & D.
From IH-35 (Northbound from Mexico) -- Alternate Route Exit 4 (Del Mar Blvd) drive to traffic light, turn right, drive 3 miles east to McPherson Rd., turn right on traffic light and drive 1.5 miles to Jacaman Rd., turn left on traffic light and drive to Sinatra Parkway, turn right to access parking lots A & D.
From IH-35 South (Southbound from San Antonio, Texas) Exit 8 (Milo/Bob Bullock Loop 20), turn left at traffic light (Bob Bullock Loop) and drive 7 miles southeast up to Jacaman Rd., turn right on traffic light and enter the Sames Auto Arena through Arena Blvd to access parking lots B & C.
From Saunders St. / Highway 59 Eastbound Traffic If going eastbound on Saunders St., drive up to Bob Bullock Loop traffic light, turn left and drive 3 miles north, turn left on Sinatra Parkway and enter the Sames Auto Arena through Sinatra Parkway to access parking lots D & A. From Highway 59 Westbound Traffic Driving on HWY 59 coming west, turn right at traffic light on Bob Bullock Loop and drive 3 miles north, turn left on Sinatra Parkway and enter the Sames Auto Arena through Sinatra Parkway to access parking lots D & A. From Highway 359 Westbound Traffic Driving on HWY 359 coming west, turn right at the traffic light on Bob Bullock Loop and drive 4.5 miles north, turn left on Sinatra Parkway and enter the Sames Auto Arena through Sinatra Parkway to access parking lots D & A. From Highway 83 North Driving on HWY 83 North turn right at traffic light on Bob Bullock Loop and drive 7 miles north, turn left on Sinatra Parkway and enter the Sames Auto Arena through Sinatra Parkway to access parking lots D & A. Facility at a Glance: Concert End Stage -- 9622 capacity Concert 3/4 House -- 6780 capacity Concert 1/2 House -- 4144 capacity Ice Hockey -- 8065 capacity Arena Football -- 8067 capacity Basketball -- 8665 capacity Amenities: Over 2,000 well-lit parking spaces Two food courts TV monitors in concession areas Team store Six box office windows Six spacious meeting rooms Custom made, adjustable scoreboard weighing 10,500 lbs. Ice Rink -- 200 ft. x 85 ft.
Did You Know . . . ? You can fit 261,327 hockey pucks on the ice floor; 480,000 on the event floor. The square footage of the building is equal to 88 two-thousand square foot houses or 2,816,000 hockey pucks. It would take 3,192 hot dogs (end to end) to encircle the perimeter of the building. If you stacked 640 hockey pucks on top of each other, you would reach the bottom of the truss; 986 to reach the top of the truss. You can hang 48 (4,000 pound) pickup trucks from the roof at the same time. There are 30 rows of seats. The large roof trusses span 280 feet (1,120 pucks end to end, 3,584 stacked pucks, or 560 hot dogs). The building houses more than 1,000 tons of steel. If you sat each block end to end, they would stretch nearly 35 miles. Thirteen miles of piping lie under the ice slab. The facility was constructed in 16 months. Smoking: Smoking is prohibited inside the Sames Auto Arena. There are designated smoking areas outside the building. Cameras: Restrictions on the use of still and video cameras vary by event. Some events permit still cameras without the flash, but not recording devices. Concerts typically do not permit any cameras or recording devices (audio or video). Guests should contact a Sames Auto Arena representative at 956.791.9192 to find out the policy prior to the event. Prohibited Items: Guests are not allowed to bring certain items into the Sames Auto Arena including; bottles or cans, food or beverages, weapons or firearms, coolers or containers, fireworks, illegal substances and laser pointers, etc. Entrances and Exits: The Sames Auto Arena has five main entrances and exits. Elevators: There are two passenger elevators available to transport guests of the Sames Auto Arena. These elevators are located on the Main Concourse across from Section 109 and adjacent to Gate B. Stairways: There are three stairwells located throughout the facility. Two of those stairwells, located on the northwest and southwest side of the building, are for emergency exit use only and lead directly to the outside of the facility. The one stairwell located adjacent to the Administrative Offices and Gate C and across from Section 113 is for patron transport from the Club/Suite Level to the Main Concourse and vice versa. History In The Making The Sames Auto Arena is a first class, state-of-the-art multipurpose facility developed by Arena Ventures LLC. This multi-use facility has introduced affordable, family-oriented entertainment to the South Texas and Northern Mexico markets, including major concerts, sporting events, family and ice shows, conventions, trade shows, and civic events. During the late 1990s, businessman Glenn Hart made frequent business trips to Laredo and consistently took note of the city's tremendous growth. He also noticed that South Texas and Northern Mexico were missing a modern venue to attract sporting events, top name concerts and family shows. At the time, area residents had to drive two or more hours to the nearest entertainment facility. So in 1999, Hart and five businessmen formed Arena Ventures -- the organization that partnered with the City of Laredo -- to build a world-class entertainment facility. The City of Laredo funded the $36.5 million project through a one-quarter percent sales tax increase that was approved by Laredo voters on August 12, 2000, with the facility's groundbreaking taking place in June 2001. The Sames Auto Arena was constructed in 15 months at a cost of $36.5 million. The economic impact to the local community will exceed $100 million dollars annually and generate hundreds of local jobs. The facility's management company, SMG Management, oversees all aspects of the arena including operations, concessions, scheduling, ticketing, and marketing. SMG Management is the world's foremost leader in the private development and management of public assembly facilities, including stadiums, arenas, theaters and exhibition/convention centers. It has been in the management business for over 23 years. It presently manages 156 facilities worldwide. With 32,000 square feet of continuous open floor space, the Sames Auto Arena has the largest indoor convention space in South Texas. The 178,000 square foot facility boasts a seating capacity of 10,000 with 14 luxury suites, six meeting rooms and a private club. The facility's luxury suites include concierge service, a television, and seating for twelve to fourteen people, among other amenities. The clubhouse level, which is on the same level as the luxury suites, features a bar overlooking the main floor. On the north end of town, the Sames Auto Arena sits on 25 acres at Jacaman Road and Loop 20 -- property that Arena Ventures donated to the City of Laredo. Arena Ventures owns 35 additional acres around the site that is currently being developed with hotels, specialized retail stores and restaurants. 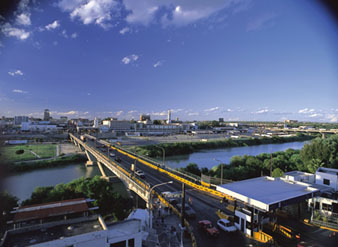 Known as the ‘Gateway City,’ Laredo is the largest, most efficient port of entry on the U.S./Mexico border. The city’s population grew 6.88% in four years, ranking as one of the top 50 fastest growing cities in the nation. Laredo has an estimated 252,309 residents, and our neighboring country, Mexico, adds another estimated 6 million tourists with 17.6 million vehicles crossing the country’s number one inland port on the U.S.-Mexico border annually. Additionally, thousands of tourists visit Laredo each year to shop across the border in Nuevo Laredo, to participate in festivals and enjoy “Los Dos Laredos”. The Sames Auto Arena is positioned for success. Businesses are booming and people are bustling as more establishments are under construction and employment rate is on the rise. Traffic around this area has increased by 10.3% in one year. Furthermore, there is not a competing facility in a 2 hour radius, which is why its market area includes all of South Texas and Northern Mexico totaling 6,500,000 inhabitants. 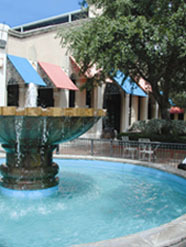 Some of its surrounding cities include: Nuevo Laredo and Monterrey, Mexico; McAllen, Eagle Pass, and Corpus Christi, Texas. The Sames Auto Arena is truly the entertainment hub for the City of Laredo and South Texas!